I didn't know what to expect from the T.R.A.F.F.I.C. 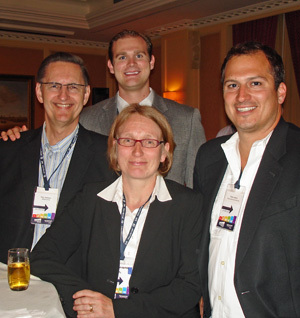 ccTLDs conference that completed a four-day run in Amsterdam June 4th. The T.R.A.F.F.I.C. series has a long record of success under co-founders Rick Schwartz and Howard Neu, but, under a licensing agreement, this show would be run by a new promoter - RickLatona.com. This would be the first T.R.A.F.F.I.C. conference ever held in Europe, the first with a program centered entirely around country codes domains and the first to have an audience dominated by European ccTLD investors rather than the mix of Americans, Canadians and Aussies who make up the bulk of the audience at U.S. shows (actually the Aussies were out in force in Amsterdam too - they seem to love long distance travel almost as much as Verisign loves price hikes!). With all of these firsts in front of me I began the trip to the Netherlands with only a rough idea of what was waiting for me on the other side of the Atlantic. When I was on my way back home a week later I was sure of one thing though - the Latona team had topped anything I could have imagined for an organization taking their first lap around the show promotion track. If you follow this industry, you've undoubtedly already heard the positive buzz from the 200 or so people who attended this event. Their high level of satisfaction again proved the old adage that a sure fire path to success is to exceed your customer's expectations. where the T.R.A.F.F.I.C. ccTLDs show was staged. 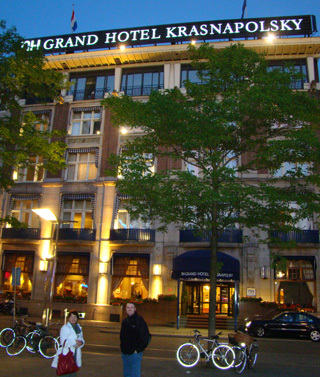 For first time visitors to Amsterdam, as my wife Diana and I were, the pleasant surprises began as soon as we arrived at the conference venue - the popular NH Grand Hotel Krasnapolsky - located in the most central location you could possibly imagine in this historic and charming city on the North Sea. The hotel sits on Dam Square, the heart of Amsterdam where you will also find the stately Royal Palace that was built in the 1600's to be Europe's grandest Town Hall (it didn't become known as the Royal Palace until King Louis I (Napoleon Bonaparte's brother) took up residence there in the early 1800s). We arrived on Sunday morning (May 31) so we could have a couple of days to explore the city before the conference began with a welcoming cocktail party/dinner on Monday night. 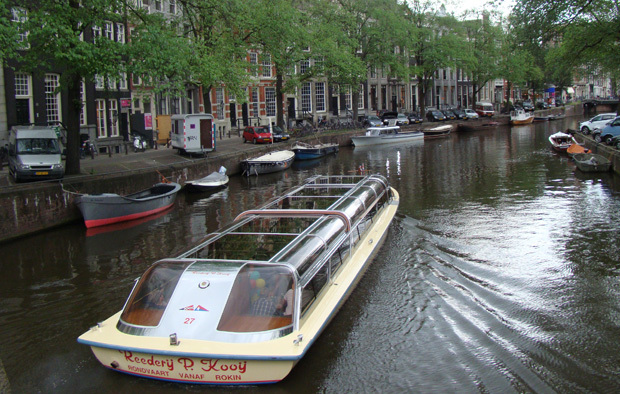 The first thing we did was hop on one of the boats that take you on a tour through Amsterdam's scenic canal system. With more than 100 kilometers of waterways within the city, you can go just about anywhere by boat. The city also has a completely different look from the canals than it does from street level - one much more tranquil than the hustle and bustle at street level a few feet above. One of the boats that took us on a tour of Amsterdam's scenic canals. Having flown all night to get to Holland, after the canal tour we headed back to the hotel to catch an early afternoon nap, then hooked up with the Neu family, Howard, Barbara and Ray, for dinner at a nearby Argentinean steak house (The Neus worked nearly around the clock with the Latona team to make sure this show would be something special). 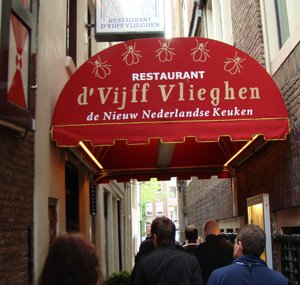 Amsterdam has more restaurants than any city I have ever visited. There seems to be one in every other storefront and every kind of food you can imagine is within walking distance. We spent the day Monday walking down the busiest shopping street - Kalverstraat - and through the historic and diverse neighborhoods that date back centuries. As evening approached we headed back to the hotel where the curtain on T.R.A.F.F.I.C. 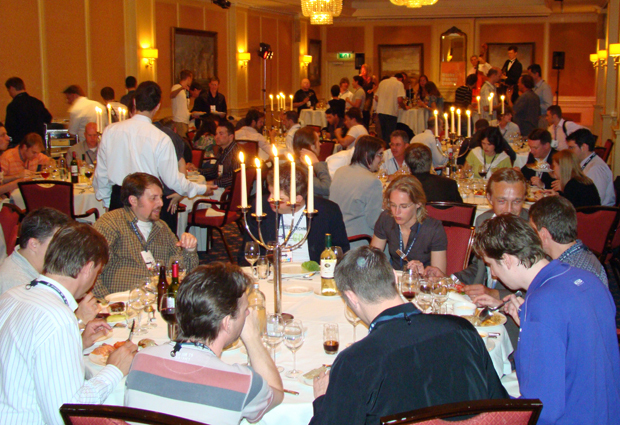 ccTLDs went up at 7:30pm with a cocktail reception and lavish buffet dinner that gave attendees their first chance to start making new friends from around the world. Getting to meet so many domainers from other countries for the first time was the highlight of the trip for me. Everything about this show was fresh - fresh faces, fresh venue and fresh content. 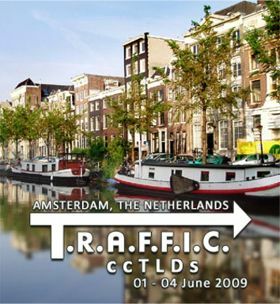 As closely as I have followed this industry for the past seven years there was still a lot about ccTLDs that I didn't know, so like everyone else I got a valuable education in Amsterdam and came back with a much greater appreciation for the mind share country codes have among Internet users outside the U.S. (a group that, incidentally, is growing much faster than the user base in the mature American market). 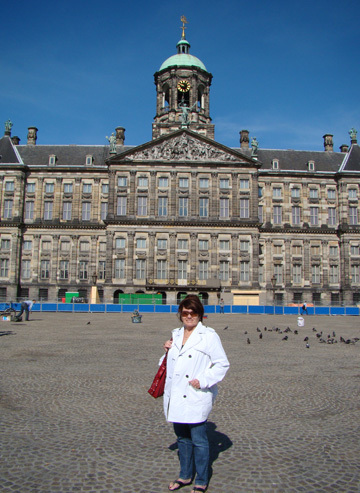 In walking around Amsterdam I saw the Dutch .nl domain everywhere - it was much more prevalent that .com. I couldn't help but think how quickly America's overlooked .us extension would go from zero to 60 if it could generate just a fraction of the visibility that European extensions have in their respective countries. 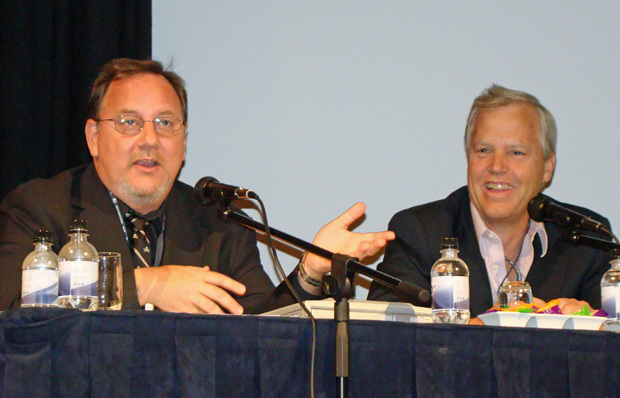 The next morning, we heard from leaders of four of those popular European ccTLDs in the show's opening seminar. Representatives from the .nl (Netherlands), .de (Germany), .co.uk (Great Britain) and .at (Austria) registries provided the latest news on their ccTLDs, background on ownership restrictions, costs and other important details for those interested in investing in their extensions. (Nominet), Michiel Henneke (SIDN), Klemens Pidner (NIC.at) and moderator Michael Ward. The four panelists represented a total of 23 million registered ccTLD - a whopping 32% of the global country code market. Phil Kingsland of .co.uk administrator Nominet said the extension is experiencing some of the biggest growth it has seen since the .com boom of a decade ago. Kingsland added that 150,000 new .co.uk domains are registered every month and that a survey showed that 80% of businesses in the UK prefer the .co.uk extension over the .com. In an interesting tidbit about Germany's wildly popular .de extension, DENIC's CEO Sabine Dolderer said 50% of all .de domains have hyphens in them! Michiel Henneke of the .nl registry SIDN said that Sedo told him the average sale price of .nl domains on their platform soared from 1,500 euros in 2007 to 2,890 euros in 2008. Klemens Pidner of NIC.at said that in a recent 90-minute drive across Austria he snapped photos of 186 domain names he saw on signs along the way. 72% of those were .at domains, 16% were .coms and 6% represented neighboring Germany's .de. 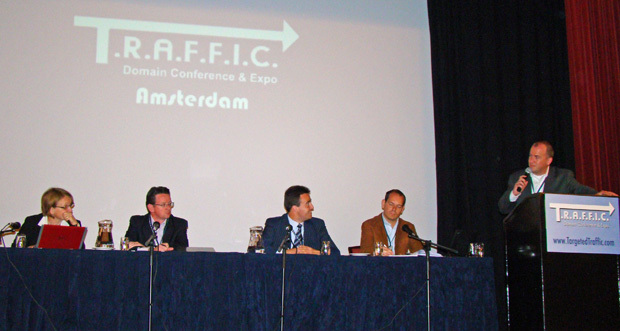 All four panelists said their ccTLDs were still growing despite the global recession. All four also agreed that they saw little usage of the regional .eu (European Union) extension in their countries. Regarding the new gTLDs that ICANN plans to start rolling out next year, the panelists universally felt that they would have a very hard time getting off the ground. They noted that success requires usage and the existing extensions are too strong to be dislodged now because people already know and trust them. 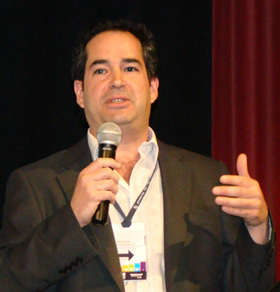 During the opening day luncheon (sponsored by Rick Latona Auctions in support of the ICA) Internet Commerce Association President Jeremiah Johnston spoke about current threats to ccTLD investors, most notably a recent move by Argentina's .ar registry to bar anyone from owning more than 200 domains. Those who already own more will not be allowed to renew more than 200 so the onerous restriction retroactively applies to people who purchased their domains in good faith under the rules that existed at the time. If this kind of policy spreads to other registries it would obviously be disastrous for domain owners around the world. speaking at the Tuesday luncheon. already had to eliminate one of only two paid positions that it had (Executive Director) due to lack of funds. Aside from Corwin, everyone else in the organization (including myself as a member of the board of directors) is an unpaid volunteer. We do it because the alternative is to do nothing and watch domain owner rights and assets disappear through legal and policy changes. My biggest disappointment in this industry is that the vast majority is doing nothing to help protect their livelihoods. As a community, we are lambs who will be led to slaughter if we don't wake up and join forces together to defend ourselves from predators who want to take away what we have. In an especially interesting seminar after lunch, five large portfolio owners discussed their experiences in the domain business and the routes they each took to find success. Show organizer Rick Latona was on that panel and he drew a big round of applause from the audience when he was introduced. Latona has become the most visible individual advocate for ccTLDs in the world since he started investing in country code domains just a year and a half ago. Latona was primarily a .com guy but as a world traveler he couldn't help but notice ccTLDs ruled just about everywhere outside the U.S. So he dove into the country code market head first and has now accumulated 30,000 of them. 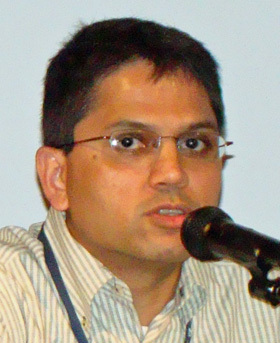 He started a special forum at ccTLDs.com to help spread the country code gospel and to cap it off he took the huge gamble of underwriting a major conference devoted entirely to ccTLDs. It was obvious the audience appreciated that the work and money he is pouring into promoting ccTLDs is building the value of all of their portfolios. Nico Zeifang, Alexander Schubert and Edwin Haward. Major .co.uk investor Edwin Hayward said that his sales inquiries jumped dramatically when he decided to stop parking his domains almost four years ago. He noted that over the past four years he has sold over 540 domains. He sold 111 total in 2006-2007 while they were parked. In the less than two years since he stopped parking them in early 2008 he has sold 431 domains, easily offsetting what he gave up on parking revenues. Rather than a parking company landing page he said each of his domains leads to a customized home page dedicated to marketing the domain to end users. In Tuesday's final panel session, representatives from three rapidly growing registries, India's .in, Poland's .pl and Mexico's .mx, provided a wealth of information on those extensions. 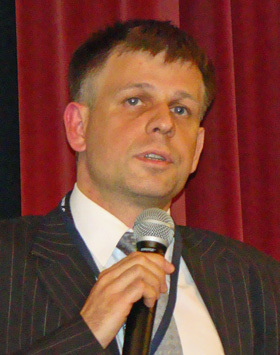 Dr. Andrzej Bartosiewicz of Poland's .pl registry, NASK.pl, was a real breath of fresh air. Unlike many other registry officials he openly embraced the professional domain investment community and the registry has established many investor friendly policies. The extension is open to anyone anywhere and the fee for new registrations is just 2.20 euros. The registry publishes free drop lists for domainers three times a day and 85% of dropped domains are snapped back up with 24 hours. .pl even has a Wait List Service that gives WLS holders a guarantee that they will get a domain if it drops within 3 years. Their domainer friendly policies have helped .pl explode in growth (70% year over year) and recently pass 1.4 million total registrations. .pl is now the 6th biggest domain in the European Union and it expects to pass France's .fr this year. You can get much more information on .pl here - DNS.pl/essentials. that English is the primary business language in India making it easier for English speakers to pick relevant .in domains. He added that there are still many good domains available for hand registration in the extension. You certainly can't ignore India's 1.15 billion population, representing one of every five people on earth! 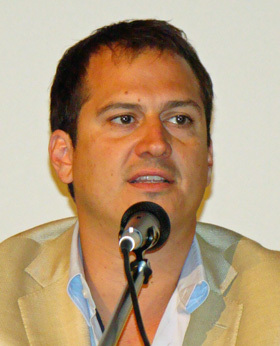 Oscar Robles-Garay represented Mexico's rapidly expanding .mx registry that has averaged 27% annual growth over the past five years. In the past you could only register second level .mx domains (i.e. .com.mx) but they have just opened up the first level .mx and it is in sunrise right now. With that move Robles expects Mexico's already fast growth to accelerate. .mx happens to be one of the extensions that Rick Latona has been investing heavily in. The next order of business was a new version of T.R.A.F.F.I.C. 's always popular speed networking session. An inner circle of chairs was placed around the sofas where people were able to lounge in the sponsor exhibit area during the day. An outer ring of chairs was placed around the first circle so attendees were facing each other around the hall. Every couple of minutes those on the outside circle moved one place to their right so that each person was able to meet dozens of new people during the 90-minute session. The Tuesday night dinner would be another one of those unique events that set this show apart from its predecessors. Tour guides led groups of attendees on a comfortable walk across Amsterdam to the historic West Indies House (where the original plans for the city of New York were drawn up in the 1600's). The evening started with a cocktail hour in the courtyard and culminated with an Indonesian buffet dinner served both indoors and out. Throughout the evening guests were welcome to walk through the house where so much history was made nearly 400 years ago. 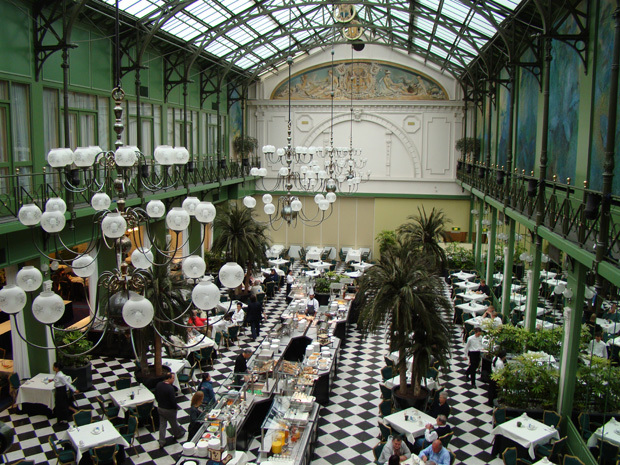 Wednesday (June 3) opened, as each day of the conference did, with a sumptuous breakfast buffet in the hotel's stunning Winter Garden. After fueling up for the day ahead, it was on to the opening seminar featuring representatives from America's .us registry and Cameroon's .cm. The Latona team did a remarkable job in getting an amazingly diverse group of registry operators to send representatives to Amsterdam. As an American I was happy to see Neustar's Ivor Sequeira there to talk about the potential waiting to be tapped in the official country code of the United States. Sequeira said .us is steadily making headway and that Neustar is seeing broad based usage split almost 50/50 between business and personal use. He also pointed to notable aftermarket sales including Video.us ($75,000), Taxi.us ($25,000), Miami.us ($15,000), XBoard.us ($12,500) and a pair at $10,000 each, Brent.us and Roommates.us. In good news for .us holders, Sequeira said the registry plans to become much more active in promoting the extension this year. Ironically, foreign corporations who are attuned to ccTLDs operate the most visible .us sites including ClubMed.us, VolvoCars.us, Hitachi.us and BenQ.us. I also found widespread interest in the extension among the show attendees who were all country code aficionados. Most felt that with the continuing growth of the Internet and growing focus on local sites that it is just a matter of time before .us breaks out. Saya Kaigama Moustapha also appeared to speak about Cameroon's .cm registry, SARL, that just opened a sunrise period with land rush scheduled to start July 15. .cm is drawing interest largely because it is an obvious typo of .com, opening up the possibility of delivering error traffic on a lot of widely searched terms. .cm will have a two-year minimum initial registration with the fees being determined by individual registrars. Ryan Steel, the President of Rick Latona's minisite development service, AEIOU.com, spoke during the lunch break. We also wrote extensively about their services in our March Cover Story about the minisite service boom. After lunch a panel featuring Rick Silver (President, N49 Interactive), Gregg McNair (Strata PPX Services) and Laurent Mullender (Sedo Product Development Manager) tackled the task of how best to develop and monetize large network's of ccTLD domains. Silver, who is based in Toronto, Canada, is developing a huge network on a spectacular collection of prime generic .ca domains including Kitchens.ca, Hardware.ca, Stores.ca and dozens of others. Silver said key components in his formula for large scale development include user generated content and mashups (for example combining lists in CraigsList with Google maps). He also sees ccTLDs as the perfect vehicle because, being implictly local in nature, they target people looking for goods and services from providers near them. He said his business revolved around a single principle, Connecting People With Businesses. Yahoo. McNair said that by using CPA and owning the entire supply chain beginning with product manufacturers, Strata PPX has been able to double revenue on a significant portion of traffic from the average portfolio. For those still reluctant to move beyond parking, Sedo's Laurent Mullender had some good news, saying that he was seeing CPC (cost per lick) rates rising again after a steady decline - in fact he said CPC at Sedo was back to where it was a year ago. Mullender agreed that development offers the highest earnings potential but that is offset by its much higher degree of complexity compared to parking. He said that in 2009 it is best to use a mix of strategies to stay profitable, including buying while prices are down, parking and also selling domains. otherwise dry subject matter (in this case Legal Issues surrounding the ownership, development and sale of ccTLDs) and making it easily digestible by applying liberal doses of humor to the discussion. 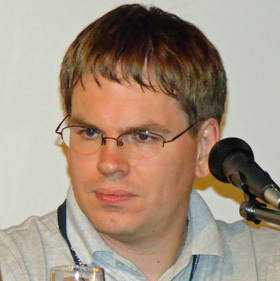 They pointed out dispute resolution procedures vary dramatically from one country to another and domain owners are at a disadvantage in most systems. Keating said that Great Britain's .co.uk is the only one that has really gotten it right in terms of fairness to all sides. In talking about the difference in trademark rules from one country to another, Berryhill dispelled a common misperception that in the U.S. Patent Office's frequently used trademark search system is a database of trademarks. In fact, no such database exists, Berryhill said, because no common law trademarks (which carry significant weight in the U.S.) are listed. This is a major difference between America and other countries where the common law concept (earning rights to a name through usage) carries little weight and trademarks almost always have to be registered with the state to be valid. The attorneys also made a point of advising the audience that if they are challenged for a ccTLD name that is clearly infringing they should simply give it up rather than wasting money fighting it and likely losing and creating a record of infringement. They said a simple one page release letter and transfer of the domain to the complainant's account will usually settle the issue before an adverse ruling is made. Whatever you do, they said to never default when your ownership of a name is challenged as this harms you and everyone else in the community (and that default will follow you in the future). 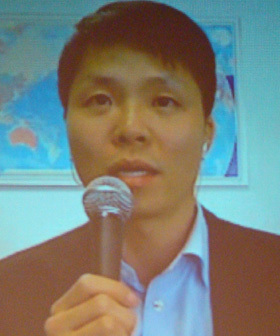 The day's final business session was a keynote address delivered by Dr. Kevin Ham via a two-way Internet video hookup that connected Ham in his Vancouver, Canada office with the T.R.A.F.F.I.C. ccTLDs audience in Amsterdam. At the start, Dr. Ham commented on this marvel of technology that allowed the two sides to connect instantaneously across 4,800 miles, through a line that ran under the ocean and into a 200-year-old hotel! Ham also marveled at the growth he has seen since he started acquiring domains en masse soon after the 2000 .com bust. When he began only 5 million .com domains were registered compared to 80 million today. Ham said he sees similar growth opportunities in ccTLDs, particularly China's rapidly growing .cn which he said offered a "unique opportunity". He added that "there will be a lot more innovation from people outside of the mature markets like the U.S. and the UK." speech via a transoceanic video link. Dr. Ham said that he loved the name of his company (Reinvent Technology) because it is necessary for us to continually reinvent ourselves. "By doing so, there is growth at an individual level as well as among people and throughout society. Each if us has the ability and the potential to profoundly impact the lives of people around us and those of future generations to come." In the question and answer session that followed, Dr. Ham was asked what people should be investing in now. He said, "the thing that would get me excited would be the growth of the Internet. I would look for a specific niche - something you see that others may not. What could you do that would be tough for someone else to duplicate? The great thing is that it doesn't take a lot of money to innovate on the Internet." Wednesday night (June 3) The Wednesday night social event was again something very special - a fabulous dinner at Amsterdam's famous Restaurant d'Vijff Vlieghen ("The Five Flies" in English). 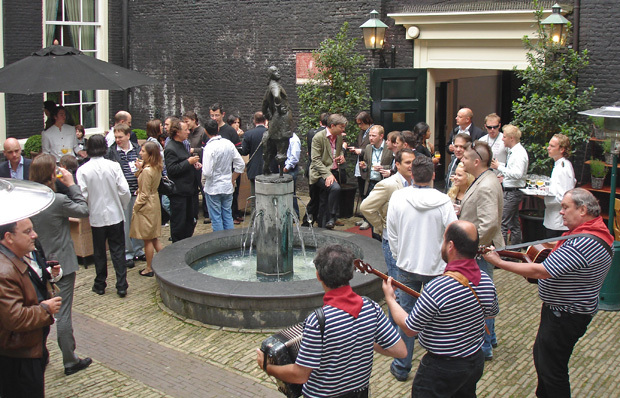 The restaurant has nine dining rooms, each with its own distinctive style recreating the rich atmosphere of the 17th century Golden Age in Amsterdam. The dining rooms in turn are spread across five historic buildings. 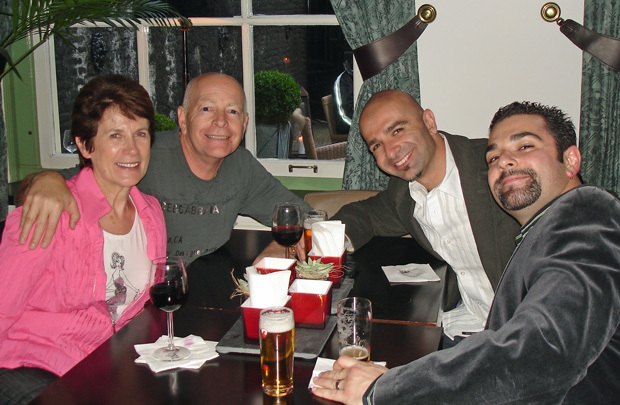 Attendees were randomly assigned to the various dining rooms so there was an opportunity to spend the evening making new friends as well as enjoying a truly memorable night out in Amsterdam. 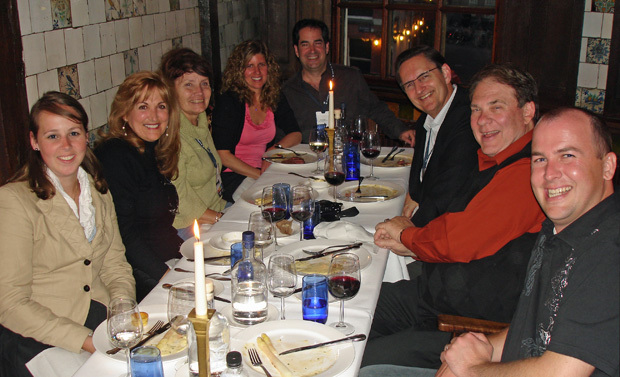 Our group included Canada's Rick Silver and his wife Debbie who were celebrating their 20th wedding anniversary in Amsterdam. Debbie & Rick Silver who celebrated their 20th Anniversary during the conference. Three leading companies that offer ccTLD registration and sales services tell you things to look out for. 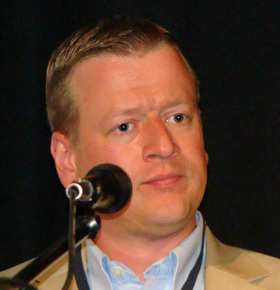 Ron Jackson reports on the latest trends in the ccTLD aftermarket. Sedo CEO Tim Schumacher picks the best extensions to invest in now! Inside Parked.com's big Closing Night party in Amsterdam. 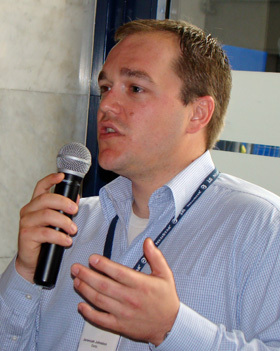 Dolderer (CEO of DENIC, the .de registry).